Cristal Taboada a , Armando Mamani b , Dirk Raes c , Erik Mathijs d , Magalí García e , Sam Geerts f , Jere Gilles g .
Quinoa is considered a strategic crop because it is well adapted to the adverse abiotic conditions of the Bolivian Altiplano; however, the average yield is low. Previous studies have demonstrated that quinoa yield would increase with deficit irrigation technology. Nevertheless, to irrigate quinoa is not a normal practice in the farming systems of the Altiplano. 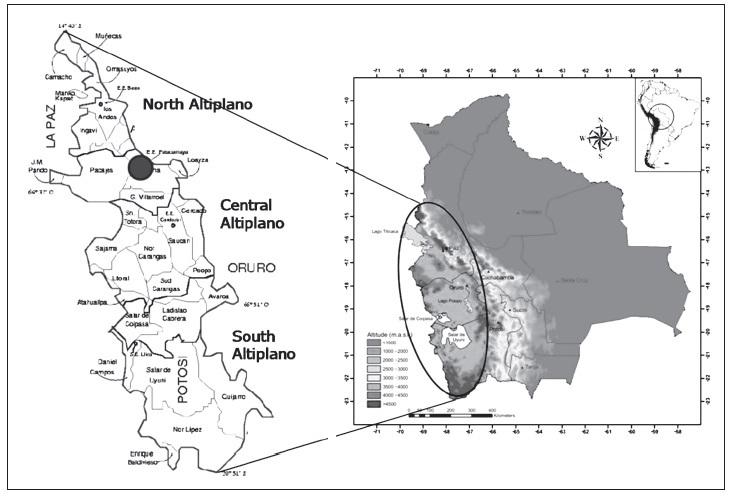 This paper examines the main factors that determine the attitude of farmers towards adopting deficit irrigation using a sample of 137 surveys in seven communities of the Central Altiplano. Statistic analysis demonstrates that the most important factors influencing farmers' willingness for irrigation adoption are the acreage planted with quinoa, quantity of surplus production for trading, and having irrigation experience. Also, the age and education level were important to know willingness to adopt a new technology. Therefore, deficit irrigation is more likely to be performed in areas where farmers own larger fields and where there is already certain type of irrigation. Actualmente, se considera a la quinua como un cultivo estratégico debido a su capacidad de adaptación a las condiciones abióticas adversas que se presentan en el altiplano boliviano. No obstante, el rendimiento promedio es bajo. Estudios previos han demostrado que el rendimiento puede incrementarse haciendo uso de la tecnología de riego deficitario. Sin embargo, el uso de riego en la producción de quinua no es una práctica común entre los productores de la región altiplánica. Este estudio ha examinado los principales factores que determinan la disposición de las unidades productivas para adoptar la tecnología de riego deficitario. Para ello, se ha entrevistado a 137 productores de siete comunidades del altiplano central. Los resultados del análisis estadístico han demostrado que la disposición para adoptar la tecnología de riego deficitario para el cultivo de quinua es mayor en zonas donde los productores poseen mayores superficies de tierra y donde ya existe cierta práctica de riego. Palabras clave: quinua, riego deficitario, adopción de tecnología. During the last decade, quinoa (Chenopodium quinoa Willd) has become more and more a cash export crop, as demonstrated by Bolivian statistics: in 2006, 7,641 tons were exported with a total value of US$ 8,903,187 mainly to the USA, Japan and European markets. Moreover, demand for quinoa in developed countries keeps increasing: many consumers direct their consumption towards more healthy food, as quinoa is considered one of the best balanced food; it is an excellent source of protein and slow-releasing carbohydrates (Comai et al., 2007). It can supply all of the body's requirements: carbohydrates, fats, protein, vitamins, minerals and fiber. Quinoa is gluten free and considered an ideal food for those prone to food allergies, making it beneficial for people who cannot tolerate common grains such as wheat, corn, rye, barley and oats. In addition, many small producers organized in producer organizations (most of them in the Southern Altiplano) receive a price premium by selling their quinoa as Fair Trade and Solidarity Market. In opposition to the opening of the international and national demand for quinoa, production levels in the main exporting countries (Bolivia and Peru) are low and constrained. Farmers constantly face restrictive production conditions, such as climatic risks (droughts, frost) (García et al., 2004; Geerts et al., 2006), the presence of only three wet months (December, January and February) and a very primitive way of farming. Thus, the production level is somewhat larger than the farmer's family consumption. In this context a lot of quinoa is being sold and transported to foreign markets, as a non- registered product (black market) (FAUTAPO, 2005). However, studies by international agencies (FAO, 1998; CAF, 2001), found in quinoa one of the possibilities to improve the overall conditions of poverty in the production countries and particularly in the most depressed areas of the Bolivian Altiplano. From a technical point of view, previous studies (García, 2003; Geerts et al. 2008), have demonstrated that quinoa yield can be increased by applying only a small amount of irrigation water during the growing period. It was demonstrated that with irrigation applications during the critical stages of growth, the yields can be stabilized around 2,000 kg/ha, which is much larger than the current average (500 kg/ha). In other words, the application of just a little amount of water might substantially raise the yield and thus the income of the farmer. Although the implementation of irrigation systems for quinoa might help to increase and stabilize quinoa production levels, it requires additional community organization, additional investment, changes in farmer's orientation and technical training which might be difficult to achieve. The purpose of this paper is to explore whether Bolivian farmers are willing to irrigate quinoa and to investigate which factors determine their willingness or lack of willingness. The remainder of this paper is organised as follows. Section 2 discusses the experiences in Bolivia with quinoa and irrigation. Data and methodology are provided in section 3. Section 4 provides the results of our analysis, section 5 is devoted to discussion and section 6 concludes the paper. Since ancestral times, Andean man has consumed quinoa (Chenopodium quinoa W.) and named it the golden grain of the Incas. Quinoa was domesticated 5000 years B.C. This is based on the archeological discoveries made in Ayacucho, Peru. Quinoa production is found throughout the Andean region, i.e. to Bolivia, Peru, Ecuador, Chile, Argentina and Colombia (NEC, 2006). Today, quinoa is cultivated mainly in Bolivia and Peru. However, during the last decade, Ecuador, Chile, Argentina and Colombia have started many research projects and studies on quinoa, such as: SICA (Agricultural Census and Information System) of the Agricultural Ministry of Ecuador; Quinuacoche CANOE program promoted by the Latin American Foundation in Colombia; Provincial Congress for Quinoa promoted by the Deputies Chamber of Salta, Argentina; Program of Encouragement for Business Design and Innovation promoted by the Euro Chile Foundation. 1. Valley quinoa grows in the Interandean Valleys between 2000 and 3000 m .a.s.l. 2. Highland quinoa grows in the Central and Northern Altiplano of Bolivia and Peruvian Altiplano. In the Central Altiplano farming systems are traditional and small. Farmers have developed mixed systems (agriculture and livestock) in order to diversify their production as a strategy to reduce production risk (Valdivia and Jete, 1996). This production system has as main crops: potatoes, quinoa, barley, cañahua and vegetables; livestock is composed of dairy production, sheep and lama. Dairy production has become more important than agriculture because the encouragement and incentives given to this activity (Camacho, 2001). Crop rotation is one of the most important activities of crop management. The pattern of rotation is: potatoes, quinoa, bean and barley (Aliaga, 2006; Mamani, 2007). Most of the farmers in the Central Altiplano cultivate quinoa. Family labour is used throughout the entire production process (from sowing to harvest) (PROINPA, 2004). PROINPA (2004) calculated that mechanization would be possible on land areas from 21 to 80 hectares ; thus increasing the potential of commercializing quinoa. Quinoa is generally sown in furrows or scattered at random after potato. Climate and pests are the most important limiting factors; drought causes the loss of the whole quinoa plant. Frost also causes a significant reduction of production. Under the cited conditions the average yield reported is 500 kilogram per hectare (PROINPA, 2004). According to official information, the sown area of quinoa in Bolivia in 2000 was 36,847 ha with a total production of 23,875 tons (see figure 1). However, Crespo et al. (2001) and Brenes et al. 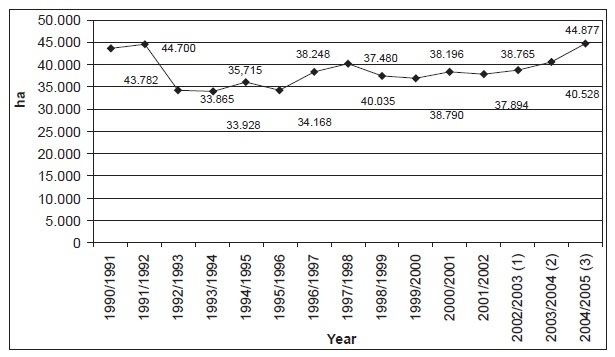 (2001) (as cited by Ton and Bijman, 2006) provide somewhat lower production figures (21,850 metric tons). According to Ton and Bijman (2006), in 2000 the destination of the marketed surplus of quinoa (estimated at 7,618 metric tons) was as follows: registered exports (1,534 mt or 20%), estimated non-registered exports (black market) (2,800 mt or 37%) and domestic market (3,284 mt or 43%). Thus, Ton and Bijman (2006) emphasize that most Bolivian exports are informal and not registered with destination Peru; the registered formal exports go to the USA and Europe. In 1967 Bolivia started, with FAO participation, a programme to study and promote the quinoa crop. Bolivian Agricultural Technology Institute (IBTA) began research in the crop cultivation area. As a result, improved varieties were obtained. Nowadays, farmers are using these varieties. The most important variety in the Central and Northern Altiplano is the Sajama variety (PROINPA, 2004), which is characterized by a low content of saponine. Therefore, this variety is called sweet quinoa. Since the 1990s different institutions -such as the Self-development Peasant-Oruro Programme (PAC-CORDEOR), the Potosí Quinoa Programme (PROQUIPO) and IBTA- focused on improving harvest and post-harvest techniques. They promoted the use of sickles and reaping machines, as well as threshers. In 1998 the producer organizations ANAPQUI and CECAOT started up a project to solve the problem of chaff presence in the product. The FAO gave technical support to the project (Soto et al., 2004). In the frame work of the project "Sustainable Quinoa Production" supported by the McKnight Foundation, the PROINPA Foundation (Research and Promotion of Andean Products) is promoting and diffusing the use of technologies, such as the use of sickles for harvest, the thresher machine and the manual or mechanic scent machine. As result of a participatory work, PROINPA was able to introduce a proposal in harvest and post-harvest activities for quinoa (see Table 1). Most of the research on quinoa is carried out on breeding, harvest and post-harvest technology improvement and even food technology. However, it is very difficult to find studies on irrigation, because quinoa is growing on marginal conditions of soil, climate and water resources scarcity (Geerts et al., 2008). Nevertheless, there are a few studies on this topic that have demonstrated that a low level of supplemental irrigation of quinoa during flowering might have important effects on final yield, while the vegetative period is almost unaffected by drought (García, 2003; Geerts et al., 2008). García (2003) and Geerts et al. (2008) have demonstrated that by applying deficit irrigation the production can be stabilized between 1,2 to 2 mt/ha. Solíz et al. (2002) conducted a study to evaluate saponine concentration (which makes the bitter taste of unprocessed grains) and composition in two quinoa cultivars 'Sajama' and 'Chucara', during plant development under three soil water deficit treatments. One of the findings showed that deficit irrigation reduced the saponin content facilitating the grain for further industrialization. In Bolivia, quinoa production systems could be grouped into two types of systems according to the growing region and farmer's production goal. Production systems of Northern and Central Altiplano, where quinoa is dedicated predominantly for self-consumption and production systems of the Southern Altiplano, where quinoa is dedicated primarily for commercializing. Communities settled in the Northern and Central Altiplano have quinoa as one of the basic components of their food although, potato is the main agricultural crop. In the South Altiplano quinoa is the only crop that has the capacity to adapt to the climatic conditions of the zone. In the three Altiplano regions, quinoa is cultivated from September to May (austral summer months), nevertheless the production techniques are different according to the zonal conditions (climate, quinoa acreage, socio economic and others conditions) (Geerts, et al., 2008b). According with the mechanizaton, the follow cropping systems are found in the Northern, Central and Southern Altiplano: traditional, when there is no mechanization; semimechanized, when agricultural machinery is used at least in one stage of the production process and mechanized, when agricultural machinery is used twice or more in the production process. Agricultural production systems in the Central Altiplano is characterized generally by multiple cropping system, production at low scale, small land size and the farmer's family constitutes the main source of labour. According to the characteristics, these zones have an economic system denominated farmer economy or "economías campesinas". Generally, the adoption of an innovation is a process that is influenced by technological, economic, socio-demographic, and institutional factors (Feder et al., 1985). Previous research related to the adoption of irrigation systems has highlighted the influence of both external factors such as access to water and to infrastructure and the availability of technical and financial support on the one hand and farm-specific factors such as cropping patterns, household income, farmer education, age and experience, and social status on the other (Shrestha and Gopalakrishnan, 1993; Chikozho, 2005; Luquet et al., 2005; Kulecho and Weatherhead, 2006; Blanke et al., 2007; Namara et al., 2007). To test the significance of the coefficients of the model, we applied the Hosmer and Lemeshow test of goodness of fit 1and the iteration history2. Also, the omnibus test and the classification rate3 were computed. Willingness to pay a system irrigation maintenance fee was used as dependent variable in order to evaluate adoption technology willingness. The independent variables were selected by mean of previous analysis and literature review. We include five farm specific variables: acreage of quinoa, share of quinoa production sold, previous irrigation experience, age and education level of the farmer; and dummy variable for community that captures external factors. Primary data were collected in five communities of the municipality of Patacamaya: Patarani (17º 15' S, 68º 21' W), Manzanani (17º 51' S and 58º 21' W), San Martin (17º 56'S and 68º42'W), Mantecani (17°06'S and 67°57'W) Toloma (17°06'S and 68°47'W) and two communities of the municipality of Umala: Iñacamaya (17º20' S and 67º54'W) and San José de Llangas (17º20'S and 67º45'W) in the Central Altiplano of Bolivia (figure 2). 1. There is at least some quinoa production. 2. There is access to irrigation. We collected survey and interview data from families with permanent residence in the community, thus we had 11 families for Manzanani, 20 families for Patarani , 20 families for San Martin, 30 families for Mantecani, 7 families for Toloma, 30 families for Iñacamaya and 20 families for San José de Llangas. In total 137 farmers have been interviewed. Production. To know the importance of quinoa crop for the farmer; including variables as: acreage, production, production destination, reasons for cropping or not. Social characteristics. To know the farmers' social environment, including variables as: producer name, family size, age, education level, migration, main family activities, institutional environment, perception of development. Production costs, including variables as: labour for the whole production process including harvest and post-harvest. Commercialization costs, including variables as: place of sell, distance, transport cost, type of buyer and sell price. Transformation and consumption. Ways of consumption and transformation. Water resource use, including variables as: kind of water source, irrigation use, irrigation system, farmer's willingness to apply irrigation for quinoa, reasons to apply or not irrigation for quinoa, willingness to apply deficit irrigation, willingness to invest for irrigation system. Small farmers in developing countries are very distrustful with foreign people and they frequently do not give all the information to the institutions (Ramesh, 2000); then it is important to get the farmer's trust. Therefore, participatory evaluation techniques were applied using an experimental field where farmers evaluated the crop growing: at initial, flowering and grain settling (harvest). Whit participatory evaluation we were able to explain the research's objectives and the deficit irrigation technology; thus, they were able to compare yields with and without irrigation. The study area may be classified into three zones considering the agricultural production system and the main economic activity. Table 2 shows the characteristics of each region. The communities of Iñacamaya and San José de Llangas are located in the Municipality of Umala. Dairy production is the main economic activity and the agricultural production system corresponds to the cropping of quinoa, potato and faba bean. According with the mechanization, less than half of the sampled farmers in these communities use traditional technology. Irrigation generally is not used for agricultural production; thus, 70% of the interviewed farmers use irrigation for forage crops, while only about 20% uses irrigation for potatoes. The communities of Manzanani, San Martín and Patarani are located in the Municipality of Patacamaya, they have livestock as main economic activity and crop production as secondary activity. Potato and quinoa are the main crops. With regard to mechanization, a large share of the sample (80%) practices traditional technology. Irrigation is not used a lot for agricultural production: only 40% of the interviewed farmers use irrigation. There are specifics crops which are irrigated, such as alfalfa, barley, potato and vegetables (e.g., beans). The communities of Mantecani and Toloma are also located in the Municipality of Patacamaya. The commercialization of onion, carrot and lettuce is the main economic activity. The agricultural production system is conformed by quinoa, potato, faba bean and vegetables. Into the three regions, the family labour is involved in the whole productive process. Nevertheless, in relation with mechanization use, relatively few farmers (20%) utilize traditional technology. All farmers interviewed use irrigation for agricultural production. The main crops are vegetables such as onions, carrots and lettuce. Irrigation is used for these crops as well as beans and potato. According to the results of our survey, potato is the most important crop and quinoa represents the second most important crop for all farmers of the communities. All the families interviewed in the communities of Iñacamaya and San José de Llangas produce quinoa at small scale ranging from 0.25 ha to more than 4 ha . In the communities of Manzanani, San Martín and Patarani less than half of the sample produces quinoa on acreage of 0.25 to 1.6 ha . Over half of the families interviewed in Mantecani and Toloma is cropping quinoa (table 3). As the aim of the research was to find the main factors that would influence the adoption of deficit irrigation technology for quinoa, the present study examined the effect of independent variables: Acreage of quinoa, share of quinoa production for selling, irrigation experience, age and education level on dependent variable willingness to apply irrigation. The survey shows that more than 50% of all farmers are willing to irrigate quinoa. 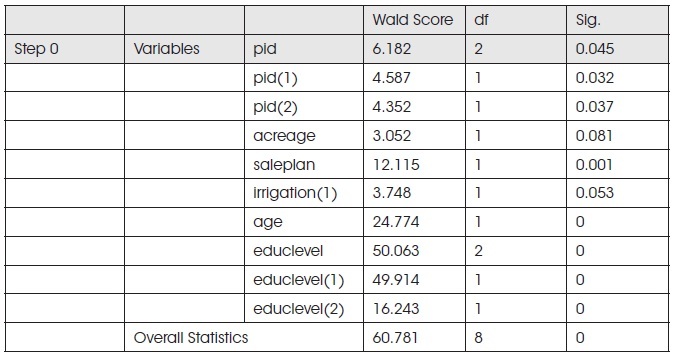 Table 5 displays the Wald statistic for each independent variables as well as dummy variables. Variables with Wald statistic significance less than 0.05 denote that the variable is significant in the model. The regression analysis (table 5) shows that acreage of quinoa (acreage), irrigation experience (irrigation), age, education level (educlevel) and share of quinoa production for sale (saleplan) are statistically significant in the model. Despite the variable zone presents a significance value over 0.05, zone 1 composed by the communities San Martin, Patarani and Manzanani displays a significant value which might be related with quinoa acreage. Variables in the equation display the sign we expected. Results indicate a consistent pattern of adoption technology with other studies (Iqbal, 2007; Mgaba-Semgalawe and Folmer, 2000; Namara et al., 2007). Variables included in the model are: acreage or size farm, it was relevant also for Iqbal (2002) who found that farm size would be a decisive factor to adopt high yielding wheat varieties and Karami (2006) who classified farmer into small, medium and large according whit the farm size for adoption irrigation technology and found the total of farmers classified as large were willing to adopt an appropriate technology. Irrigation experience is also included in the model and it is supported by research of Cameron (1999); is important to consider also that farmers who use irrigation have water access. 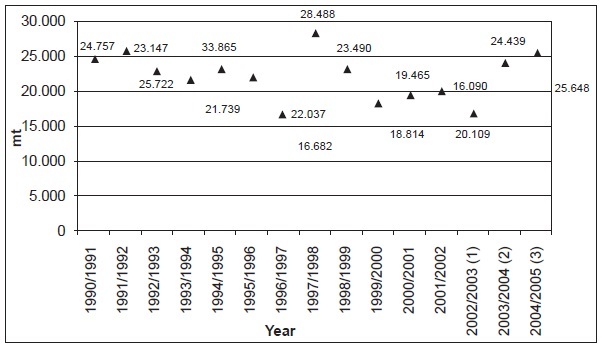 Variables age and education level are consistent with findings of several researchers like Iqbal (2002) who found that younger farmers are more willing to adopt high yielding wheat varieties, Mgaba-Semgalawe (2000) found also that older farmers have negative influence on perception, adoption and investment for the improving of soil conservation. The study area was classified into three zones considering the agricultural production system and the main economic activity. The first group, composed by Mantecani, Manzanani and Patarani, has as main economic activity agriculture and quinoa acreage larger than the second group that is conformed by Toloma and San Martin; these communities show small quinoa acreage (less than 0.5 hectares ) and the third group, composed by Iñacamaya and San José de Llangas, has as main economic activity livestock. 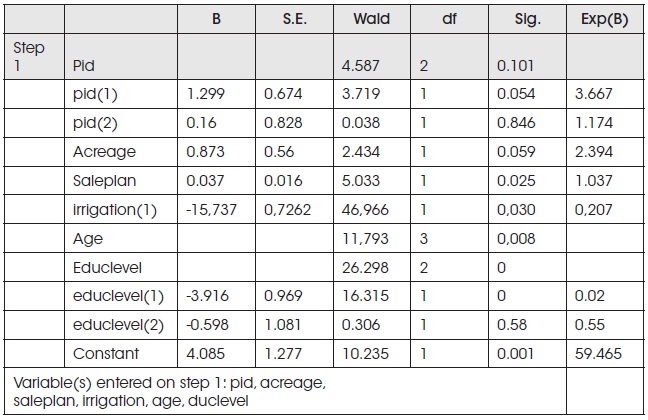 Nevertheless these specific characteristics, results of binary logistic regression displayed that the factor zone is not a decisive factor for adopting deficit irrigation. The main findings demonstrate that deficit irrigation technology is more likely to be picked up in areas where farmers own larger fields where they can obtain surplus production for sale and where there is already certain type of irrigation. On other hand also social factors should be taking into account because young people is more willing to adopt new technology than older people as well as people who reaches a higher education level.Also is important to remark that farmers decide to plant thinking at first for food for family. This is the most important reason for what the destination of the production is mainly self consumption. en el cultivo de quinua en tres comunidades del municipio de Patacamaya. Facultad de Agronomía, Universidad Mayor de San Andrés. La Paz , Bolivia. 1The Hosmer and Lemeshow test is used to evaluate the global fit of the model; it is considered more robust than the traditional chi-square test (Garson, 1998 ; Aguayo, 2007; Alderete, 2006) especially when the model includes continuous covariates and the size sample is small. The test divides the observations into deciles and compares the observed probability with the expected probability for each decil. 2 The output shows the coefficients and the logarithm of the likelihood ratio into each process of iteration. 3 For dichotomous dependents variables Classification tables are 2 x 2 tables. The columns present the predicted values of the dependent, while the rows are the observed values. A perfect model, presents all cases on the diagonal and the overall percent correct will be 100%. If the logistic model has homoscedasticity (this is not a logistic regression assumption), the percent correct will be approximately the same for both rows.